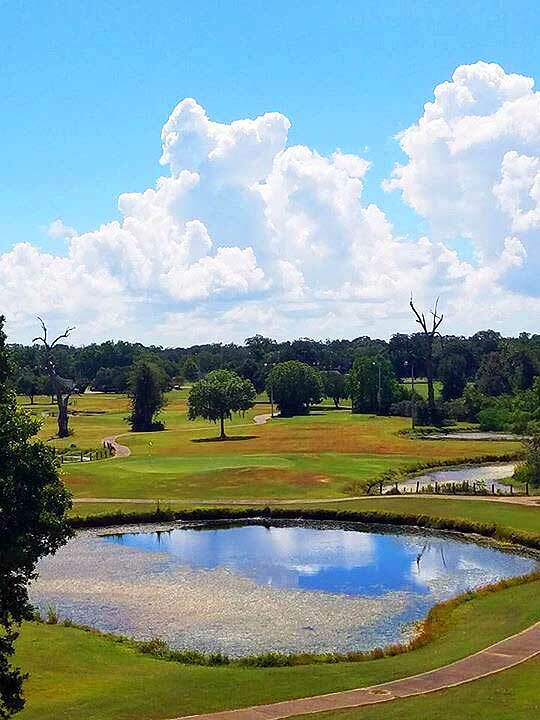 Opened in 1999, West Brazos Golf Course is a 9-hole public course. West Brazos Golf Course measures 3,402 yards from the longest tees. The course features three sets of tees for different skill levels. The course is fully lighted from tee to green. We are located in Brazoria, Texas where my father Cecil Stedman was originally from. Originally just 15 acres, the property was purchased in 1956. After my father retired in 1994, he and my mother Nancy decided to built a driving range on the 15 acres and ran that until some adjoining property next the driving range became available. And with that, the idea of putting in a golf course came about. My father started playing golf in 1969 and never stopped playing, even today at the age of 83, he plays occasionally, but still prefers to get up and mow the greens and run the shop. My mother is the bookkeeper and my sister Sally and I run the pro shop. Sally’s husband, Jack, is in charge of all ground maintenance. 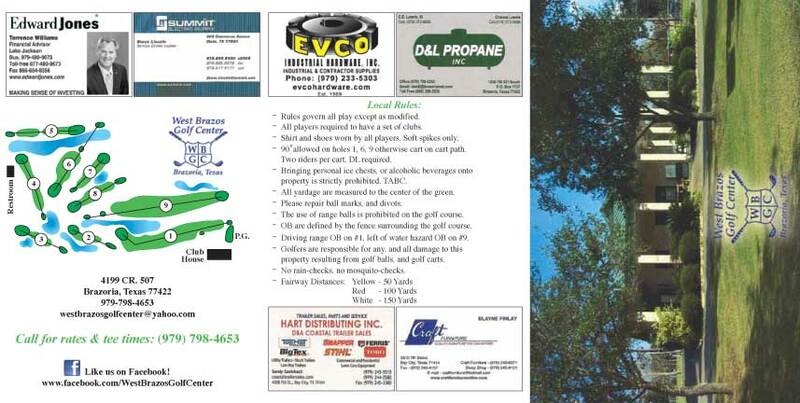 We started construction on the golf course in December 1998 and opened in October 1999. 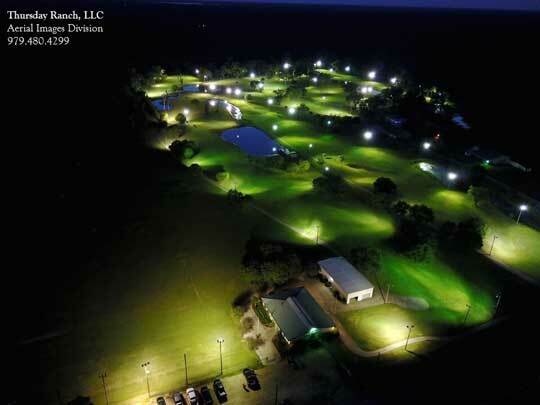 West Brazos Golf Center is still family owned and operated to this date. USGA Rules shall govern all play. All players will wear shoes, shirts, and trousers. No alcoholic beverages brought in from the outside. All players are requires to have a set of clubs. 90 degree allowed on Hole # 1, #6, & #9. Golf shoes with metal spikes are not allowed. Do not use range balls while on the golf course. No rain checks, no mosquito checks. Out of bounds are defined by the fence surrounding the golf course. Left of range fence is out of bounds on hole #1. Left of the water hazard is out of bounds on hole #9. Repair all your divots and ball marks. Light poles, cart paths and pump house are to be played as immovable obstruction (one club length near point of relief, (no penalty). Evening play and closing times will be determined by the amount of play on the golf course. Call for tee times after 5:00pm! Do not cross a fence to retrieve golf balls. That is private property, and you could be arrested for trespassing. Golfers are responsible for any and all damage to this property resulting from golf balls and golf carts. Cheating during scrambles will not be tolerated and players will be asked to leave and not return to our facility if this occurs. ** If found not following these rules and regulation players will be asked to leave. ** Alcoholic beverages can and will stop being served at the clubhouse discretion. Tee times required after 5:00 p.m.